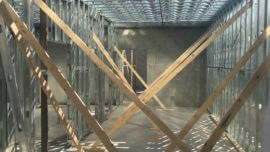 What is Cold-Formed Steel Framing? Cold-formed steel framing (CFS) is made from sheet steel that is formed into C-sections and other shapes by roll forming the steel through a series of dies at room temperature. Heat is not required to form the shapes, hence the name cold-formed steel. A variety of steel thicknesses are available to meet a wide range of structural and non-structural applications.